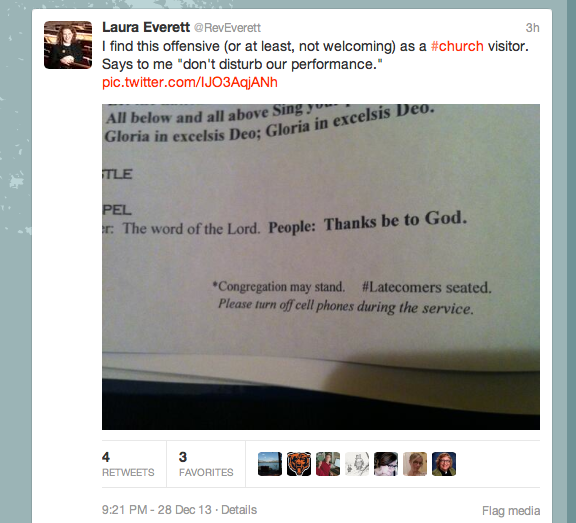 Posted byRevEverett	 December 29, 2013 1 Comment on Is it rude to seat latecomers later in the service? Or is your church just being clear? I was out of town for Christmas Eve this year and visiting a church out of state, which shall remain nameless. I suspect many people in the pews were not regular parishioners at this particularchurch. While I made it to church on time, I read these words about how “latecomers” with be handled and turning off cell phones as insinuating that the big threat I posed was a disturbance. Perhaps I read these as a defensive newcomer, but they landed with a thud that implied my late arrival would disturb their precious performance. I am thankful for a GREAT twitter conversation that clear, kind directions can help newcomers find their way through unfamiliar practice. Read Peacebang’s ( @Peacebang) thoughts here: http://www.peacebang.com/2013/12/28/is-it-rude-to-seat-latecomers-later-in-the-service/ Yet, I did not experience the bulletin notes as clear, kind directions but rather warnings against disruptive behavior. Almost nothing in this service gently and tenderly initiated the unfamiliar into the practices of the community. The cues about which worship book to pick up were given through three letter codes with no secret decoder ring (Perhaps you’ve seen these before? BCP= Book of Common Prayer, LBW= Lutheran Book of Worship, GtG= Glory to God, the new Presby hymnal, TFWS= The Faith We Sing, Methodist. Every tribe has ’em). The Christmas Eve sermon started with the preacher listing off all of the things that had been going on in the parish in the month leading up to Christmas as examples of how busy we all are- total insider baseball about internal parish committees. When we got to The Lord’s Prayer, I habitually marched along saying “Forgive us our sins, as we forgive those who sin against us” while others around me prayed for debts and debtors. For the record, this church’s website proudly proclaims “We are a welcoming congregation!” Most churches claim this. Being welcoming is a skill that can be learned and a discipline that must be practiced every time we gather for worship. I’m an itinerant preacher, practiced in showing up to unfamiliar congregations. If I struggled with joining in this service, I suspect others did too. For those of us practiced in church, things that are familiar to us are totally foreign to many. What is the fundamental orientation of our bulletins and our service? Is it designed for those already on the in? Are we giving clear and kind directions about how to participate in the particular rituals and practice of the community? It is not safe to assume that people know what it means when your bulletin says “Doxology.” If your bulletin includes text that says “The Lord’s Prayer (debts, debtors),” you are assuming that people know the text of the Lord’s prayer. And I love your liturgy, my dear Episcopal sisters and brothers, but your words that cue up the offering are secret code known only to you and leave the rest of us scrambling for our wallets as the ushers start walking towards us! “is it really so offensive to provide guidance to make things run smoother? Clarity’s kinder than opacity. Guidance in and of itself isn’t offensive, but tone and orientation matter. For whatever reason, this church on this night wasn’t communicating kindness or clarity about how to participate*. How do you assess if your bulletin and liturgy give sufficient guidance to visitors?